This is a fabulous sweet Italian sausage recipe. Sausage isn’t as difficult to make as you might think. You do need a couple of kitchen tools, but once you invest in them you have them for years. In North America, the two most familiar Italian sausages are sweet Italian and hot Italian sausages. They are both fresh sausages (salsiccia fresca in Italian), and they contain similar ingredients, with one notable exception: hot Italian sausages contain copious amounts of hot pepper flakes. – A meat grinder with sausage stuffing attachment, or a meat grinder and separate sausage stuffer. Cut pork into pieces small enough to fit in the throat of your grinder. Using the coarse grinder plate, grind pork into a large bowl or stand mixer bowl. Add fennel seeds, salt, pepper, paprika and garlic powder to the ground pork. Using your hands or the stand mixer paddle attachment, mix until seasonings are evenly distributed. Add wine and mix until white strands appear in the mixture and a handful of the mixture holds together. In a small skillet, over medium-high heat, sauté a small amount of the sausage mixture until no longer pink. Taste the sample, then adjust seasonings as desired. Stuff the sausage mixture into the prepared casing as directed below. Twist into 6 links, each about 6 inches (15 cm) in length. Once you are satisfied with the flavor of the meat mixture, it’s time to stuff sausages! First, you will need to decide which extruding tube (or funnel or horn) to use. Always use the largest tube on which the casing will fit but still move freely. You should not have to stretch the casing. The user manual that came with your equipment will help you determine the appropriate size tube for the diameter of casing you are using. If you don’t have the manual, use the smallest tube for breakfast sausage. For other sausages, you may need to use trial and error to determine the best tube to use. Attach the extruding tube to the grinder or stuffer. Pull one end of the casing out of the bowl it is soaking in and open it with your fingers. Scoop a little water from the bowl into the casing so that it will slide on and off the tube easily. Place the open end of the casing over the extruding tube. Slide the full length of the casing onto the tube, then tie a knot in the end of the casing. Turn the grinder, stuffer or mixer on and, with one hand, slowly and steadily feed the meat mixture into the tray, pushing it down with the stopper or food pusher. With your other hand, hold the casing just beyond the end of the tube to help guide the sausage into the casing. As the meat mixture begins to fill the casing, try to maintain a consistent thickness; the casing should be full, but not to the point of bursting. Once all of the meat mixture is fed into the casing, cut off any excess casing and tie a knot in the open end. Gently twist the stuffed sausage into the number of links indicated in the recipe – or as desired. How long to make your sausage links is really up to you. Keep in mind that the number of links specified in the recipe is a rough guideline; you may need to adjust the length up or down so that you don’t end up with one link smaller than the rest. Cracking Fennel Seeds – The easiest way to crack fennel seeds is to place them on a piece of parchment paper on the kitchen counter and roll over them with a heavy rolling pin. If you use your hands to mix the ground meat, have a bowl of water nearby in which to dip your fingers. This will help keep them from getting too sticky. To turn this recipe into one for hot Italian sausages, just add a teaspoon (or more or less to suit your taste) of dried hot red pepper flakes into the mix as you are adding the seasonings. One of numerous phytonutrients found in fennel seeds is rutin, a compound with powerful antioxidant and anti-inflammatory properties. Oxidative damage and inflammation are both linked to many chronic diseases. This recipe comes from a wonderful book called The Complete Art and Science of Sausage Making: 150 Healthy Homemade Recipes from Chorizo to Hot Dogs . 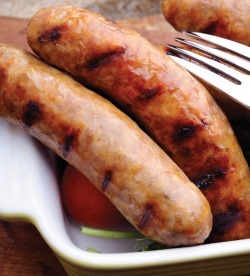 It is full of a huge variety of sausage recipes, including those for chorizo, Polish sausage, Soppressata, Curry sausages, Pennsylvania Dutch sausages, chicken and turkey sausages and hot dogs. It even has some tasty sounding recipes for vegetarian and vegan sausages. If you ever thought you might want to try your hand at making your own homemade sausage, this is the book to have. Homemade sausage is so much healthier than anything you would buy. It’s fresh, with quality ingredients and you know exactly what’s in it. No filler, just pure goodness. If you like this Italian sausage recipe, you may want to browse all of our Italian recipes here. Reprinted with publisher permission courtesy of The Complete Art & Science of Sausage Making by Tonia Reinhard, Brendan Reinhard & Brent Mitchell © 2016 www.robertrose.ca.